We are in full autumnal mode with our garden right now. This is what it produces in the months of October and November, before it takes its annual winter rest. We harvested the rest of the late pear tree. These pears have a thick, partially-russeted skin. Their variety is Conference. This variety is known to be productive and the pears are long-keepers. I harvest them in October, and they will keep in the refrigerator until January. They need a ripening period on the counter, for about 5-7 days, to soften up. Our pear harvest was spectacular this year! We've been eating fresh pears near daily, since early August, and have at least 1 large refrigerator drawer-full left (enough to give us fresh pears, near daily through most of November). Later this month, I'll be harvesting cranberries. Our cranberries didn't do as well this year as previous years. It could be the extreme dry summer we had, or that the soil had been disturbed to plant a hedge adjacent to the cranberry patch. But, I didn't use all of the cranberries from last year. I still have a quart in the freezer. So, at least I have enough for a batch or two of cranberry sauce. In the veggie garden, I still have 3 heads of cabbage. I've been picking the cabbage largest heads first, so I am down to the smallest of the patch, but which should fill our cabbage wants for the rest of the month, and maybe into the first week of November. If I don't get to using all of the cabbage before hard frost, cabbage is one of the veggies that I can put a row cover over, to "keep" the cabbage a while longer. I have a clear, plastic-sheet tunnel that I can use over the cabbage and kale, to "keep" those veggies all of winter. They won't grow past the end of this month, but can be held until use. The carrots are as big as they will ever be this season. In our area, its understood that carrots pretty much finish growth by late September. But I can keep them in the ground until early November. I didn't thin them, as I should have, so what I have in the garden are lots of baby carrots. I've been pulling handfuls of small carrots all month. I have enough carrots to last the rest of October, using them twice per week in dinners. I have 3 types of greens in the garden that are still doing wonderfully, radish greens, Swiss chard and kale. The Swiss chard is most vulnerable to frost, so I am using that mostly for now, leaving as much kale and radish greens for late month and through mid-November. The lettuce has just stragglers left. So our salads are mostly from the cole family, with an occasional lettuce leaf or beet leaf thrown in for interest. I have pulled the largest of the beets, and now have small, 1 to 2-inch diameter beets left. We've had quite a rainy period, and it's possible the beets will gain in size over the next week or two, so I'm refraining from pulling any of these smaller beets now. I can leave them in the ground as long as the carrots, so there is no rush to harvest them. I do use some of the leaves, especially with the beets which were planted too late to really develop a root. I still need to dig the other half of the potatoes. They were buried under the sprawling pumpkin plants, so I only dug the half that I could easily get to. I am hoping that I find many potatoes under the other half. I grew white potatoes and purple fingerling potatoes, using seed potatoes saved from past years. I've put away a dozen seed potatoes for next year, from the half-patch that I dug in September. I still have tomatoes and apples, already harvested and in use in meals for this month. And my figs, although a bit on the late side of their harvest, are still sizing up, so I'm leaving them on the tree through this week. The tree is on a south-facing wall, so it benefits from the heat-trap effect. These fresh figs have been a nice addition to fruit cups. 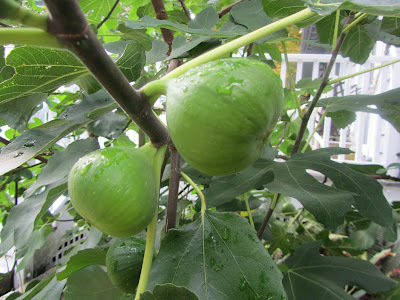 At the end of next week, any figs not sized-up will be used in spiced fig jam. And that's about it for what's left in our garden for this year. The garden will rest from mid-November through early March. Sometime in March, the Swiss chard, and kale will make a comeback, before going to seed. In addition, the watercress will have seeded and be ready for use, and the sorrel, a perennial, will be up and at its tender best, at that time. Gone are the lettuce, cucumber, tomato salads of summer, for this year. It's always sad to say goodbye to the delicious garden veggies of summer. But in exchange, we do get to say hello to the lovely, crunchy, dense salads of autumn. I've been making this particular salad for October. It uses items from our fall garden, and is packed with nutrients and flavor. It's especially frugal for me, as I grow most of its ingredients. And I think it would be easy to switch things up, according to what I have on hand. I like the combination of sweet, sharp and salty. Apples and dates lend sweetness. Mustard and baby kale add that sharpness that makes it interesting. And bacon gives it that savory/salty taste that I love. Cabbage basically puts the kale on mute. 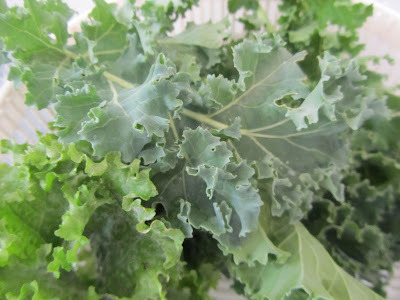 It adds bulk and more healthy veg to the salad, without going overboard on the kale flavor. Prepare the dressing in the bottom of a large bowl. Toss with the vegetables and fruits. Sprinkle the bacon bits on top, and toss just before serving. 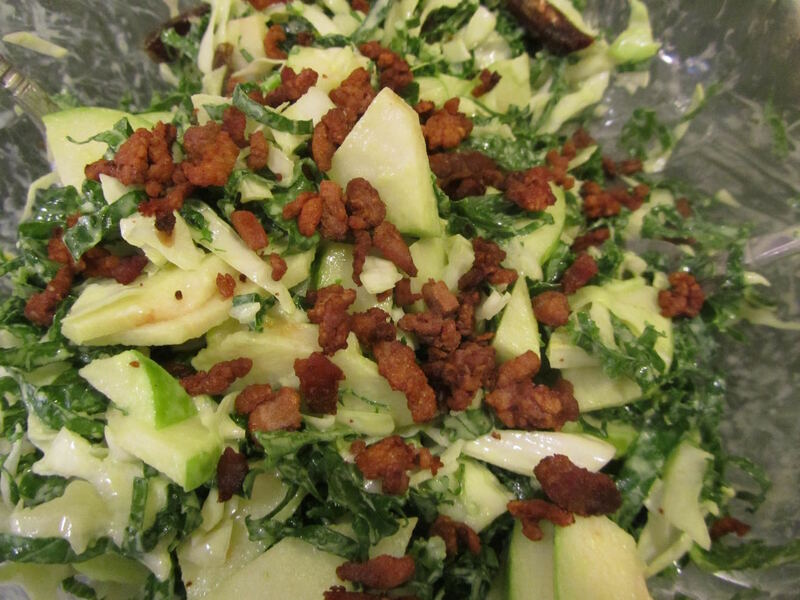 This salad can be prepared several hours before serving, and kept in the refrigerator. Don't mix in the bacon bits until just before serving, to maintain their crunch. Your pears look like our pears. 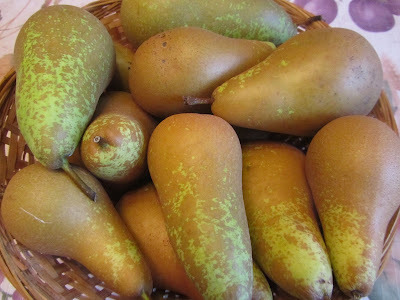 That may not even be possible since we live in Ohio, in a different zone, but they look like our pears...green and partly-russeted. I have no idea what variety of fruit trees are in the orchard. We moved into our house in 2012, and the orchard was already mature. The people living in the house when we bought it didn't know either since they were the second owners and the original owners had planted the trees. I spent about an hour online a couple of years ago looking at pictures of pear varieties in Ohio and trying to identify our pears. I narrowed it down to a few, but couldn't make a clear identification. At that point, it didn't matter anymore. They are delicious, that's the important part! Oh, the picture and description of that salad! I will be making that soon. I don't have any dates, but you mentioned dried cranberries and those I have. I bought 15 packages of dried cranberries for $0.50 each in the manager's special bin at Kroger last week. They are dated best by mid-January 2016. My 13 year old son questioned if we could really use that many dried cranberries in that short amount of time. I'm thinking yes! Dried cranberries thrown in green salads, creamy chicken salads for sandwiches and crackers, oatmeal, cookies, granola, quick bread or muffins, even in stuffing! I also found a recipe for a holiday dip with cream cheese, orange juice and dried cranberries. We won't have any trouble using the cranberries, I'm sure! it calls for pecans (which I haven't had around for a couple of years, due to expense), so I've been subbing chopped almonds, and love those just as well in these cookies! The recipe came from Southern Living, with a few adaptations on my part. I wonder if your pears are Conference. It's a very popular home orchard choice, as it's very productive and has few pests or disease issues. Enjoy your pears! While they grow very well for us, a lot of people think of them as a luxury fruit. Have a wonderful day, yourself, Angie! Good job, Lili. Our garden (my dad's garden) is now done for the season. Not one thing left and for that I'm sad but we sure did get a lot and I'm thankful my dad looked after me so well this summer. That salad looks wonderful but I don't have half the ingredients. I might have to think about that next summer before everything gets eaten or frozen! I have a bag of dried cranberries but I just don't love them. Kind of like raisins--I never developed a liking for those either. Is there some way to make me like that stuff better? My kids never liked raisins either. I have made brown bread which is a sweet bread with raisins and I DO like that. I bake it in soup cans. Would cranberries work in that? For your dried cranberries, how about an orange-cranberry tea bread? If it's a texture thing with raisins and dried cranberries, you might like them better when softened up before baking, by soaking in a bit of boiling water for 1/2 hour, then draining. I sometimes do that with raisins, in oatmeal-raisin cookies. It keeps the raisins from scorching while baking, but also gives them a very soft texture, which is what I'm thinking your brown bread does to the raisins. Alice, how blessed you and your family are to have your dad and his gardening abilities. I hope to be able to do the same for my own kids when they have families of their own. Have a lovely day, Alice. I think I could tell the time of year even if I didn't look outside by what appears on our table! My husband has been going crazy with the pears and apples at the farm market. Our green beans are done, but we still have carrots and beets in the garden. I know what you mean -- we're having Swiss chard and winter squash with dinner tonight. I put pears into lunches today, and I had a pear with my breakfast. Definitely feels autumnal in the kitchen these days! We don't have seasonal gardening, so we're very lucky in that sense. Less planning for sure, so our garden life is pretty plain and simple. Good for you that you are able to find recipes and delicious side dishes using the vegetables in your garden almost exclusively. That is such a savings to the food budget. I recently discovered that I can freeze papayas. My dad enjoys eating that every day so it was a challenge to find nice ripe papayas every week at a decent price. Now, I look for VERY ripe papayas sometimes sold 3 lb./dollar and buy a dozen papayas at a time. I slice it into eating size pieces and freeze into daily portions. It is delicious frozen and holds up very well when thawed. Just saying, since you mentioned before that you love papayas. Before I knew to freeze papayas, I would hesitate to buy too many very ripe. Yesterday, I saved about $8 for the 12 papayas bought. I keep track every day of how much I save finding a cheaper, better way of accomplishing the same task. It is astounding how much can be saved....on average I save about $500/month just by thinking, searching, researching, DIY'ing, substituting, doing without etc. That's not the savings from shopping sales, which is a given. Wow! 3 lbs for $1, that's phenomenal! So, does the texture change much after freezing and thawing the papayas? I also think they'd be delicious in fruit smoothies. And I agree, constantly looking for better, more economical ways to do or obtain things is what gets us to our financial goals. The surprising discovery was no texture change whatsoever. I like to eat my frozen papaya cubes with a bowl of cold cereal. Keeps the milk chilled while the fruits thaw. The thawing papaya is nice and firm like the fresh fruit. The fruit vendors don't drop their prices on the unripe papaya but fire sale the over ripe ones because those won't last another day without refrigeration. I just thought I'd mention how much savings a few dollars here and there adds up. I started to journal my "frugal savings" this year because I wanted to see whether spending time and energy being so frugal pays off. Whenever being frugal took some time, I jotted the savings. And to be fair I noted the losses from oversight. YHF, years ago, I kept a little jar that I'd fill with coins, every time I'd save money doing something frugal. I eventually ran out of coins, so I had to write myself IOUs -- which was basically what your journal is. It was surprising how much I would save each and every day. Then a couple of years ago, I needed a boost, so I began keeping a journal in an old notebook, writing down my top 5 frugal actions each day, and in those top 5, I was still saving quite a bit, each and every day. Thanks for sharing that, Lili....I thought I was going "overboard" by writing the savings down. I can very well see running out of coins or even dollar bills doing this. It is simply an eye opener when you write the amount of savings down vs. just noting what frugal activity was done. I suspect the savings I'm experiencing may be a lot of "low hanging fruits", the easy stuff, since I have not been frugal enough these past years. But as the years go by, and I become a pro at this, I think the savings may be harder to realize. Like squeezing juice from an overwrought lemon. YHF, new savings might be harder to find, but you will still continue to save with all of the "low hanging fruit". And those savings really do add up. Plus, after retirement, you may find that you have enough free time to explore new ways to save that are more lucrative. LOL...now that's a happy thought!! In fact, one of our reitrement plans has us doing just that...I call it hunkering down and living on just my social security, not husband's until 2019, when he's 67 and I'm 65. The amount I will receive should cover our basic fixed expenses (I won't receive much but our fixed expenses are that low), and the rest we'll draw from savings. That is good incentive for us to be as frugal as possible. I think a good few years of tightening our belts will teach us lessons that will become so ingrained. That way, we'll never outlive our savings and have something to leave for our children and grandchildren. What a beautiful head of cabbage--no bugs. I have a friend who has potted fig trees that he grows inside during the winter and they still produce figs. Not a lot, but some. Have you ever tried a fig tree inside? Sounds like it is just up your alley. the bugs are hiding on the inside -- earwigs. 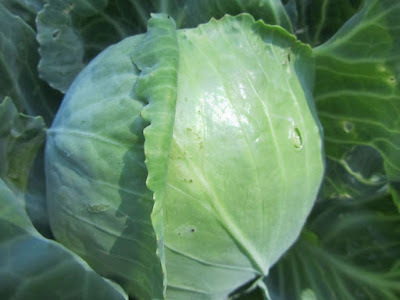 But, we are very fortunate this year to have not had a problem with cabbage moths and their larvae. My fig trees used to be in pots, but they needed more root room. In my dream house, I'd have a large conservatory attached to the house, and I'd keep potted lemon, tangerine, and fig in there. It's so interesting to me to hear which plants thrive in different parts of the country. I'm still harvesting cucumbers and tomatoes by the bucket full, and the peppers and eggplant are still ripening. The zucchini has finally slowed down, but it's still producing. I'm not sure if it's the hot dry climate, or if I just need to be better about spraying with neem oil or insecticidal soap or something. Anyhow, I was gonna build a cold frame and start some spinach this fall because I've had better luck with it in the fall than spring. Alas, time sorta got away from me. Of course, we're still having temperatures in the 70's and 80's so perhaps it's not too late to give it a try! Anyhow, enjoy your fall bounty! Well, you're right that different plants do better in some climates than others. Where I am we have cooler nights and marine air even in summer. I can do tomatoes well, but have a difficult time with peppers and eggplant. However, I can grow loads of kale and cabbage. For you, if you ever really wanted to have your own homegrown kale, you could try a floating row cover, the kind that's super lightweight (to keep from heat build-up), but it does keep insects out. And it could be that you would need to pant seedlings out earlier in spring (start seeds indoors). I know for my area, the aphids are worst once the heat of summer has been on for about a month. But you could possibly get a harvest of late spring kale with few problems. Enjoy all of those tomatoes, cucumbers, eggplant and peppers! Hmmm... that's an interesting idea - I'll have to explore the row cover idea. It would certainly help with bugs. I'd still have the problem of things bolting before they get big enough to eat, but maybe it would provide a bit of shade too? Cat, I visited this city garden in May of this year. It can get very hot when the sun is directly on one of these gardens (and everything was in raised beds, surrounded by concrete). They used shade cloth, extensively, over any vegetables that would normally do well in the cooler months of spring, here. Shade cloths might give you a longer growth period with all of the leafy greens, from spinach and lettuce, to kale and Swiss chard. And it can be reused year after year, if you take it down when not in use. You can even use sheer curtains (picked up at thrift stores for cheap) for shade cloth. Put up some supports, then attach the shade cloth at the corners. I've also seen nice, more permanent shade structures built of wood slats. One more thought, you could grow greens in pots on the east side of your house, where they would get morning sun, only. Or, you could just grow what is easy, and skip all of the extra work. I devote very little garden space to things which are difficult to grow, here. Oooo... now you've given me a whole pile of new ideas. I actually have a covered patio on the east side of my garage. The covering is that fiberglass greenhouse stuff, so it gets light, but it's filtered. That would be a great place to try some greens in pots next year. Cat, you'd probably want something about a 40 - 55% shade rate. Your sun-sail is likely much higher. Yeah, it's worth a try, for something like spinach, in pots, on the east side of your garage. Especially if you happen to have the seeds and pots already.